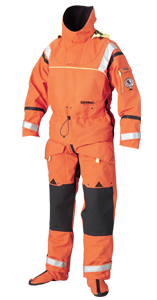 Ursuit® Gemino Operative line is designed for professionals in extreme conditions. With integrated Gore-Tex® socks you can choose shoes that best fits your needs. High collar that is lined with water resistant fleece and integrated yellow fluorescent hood. Braces in trousers. Waistband. Includes separate neoprene hood and gloves. In upper part of trousers pocket for phone. Includes carrying / storage bag.